You’ve got a house to sell. You’ve got inside pets. You’ve got a problem. I understand you’re dilemma; I’m a pet lover too. I have something that I need to tell you. It’s something that your friends won’t tell you, but you need to hear it. Ready? Ok, here goes: your house has pet odor. Deny it all you want. It’s a smell that you are probably used to, but trust me, there is an odor. Sometimes, pets and real estate don’t mix. At best your pet may distract your potential buyer. At worst, it may turn them off on your house completely. When I was a brand new baby Realtor I went to preview a house with my sales manager. We called for an appointment but no one was home, so as agreed, we let ourselves in to check out the house before bringing over a potential buyer. As I was trying to find the light switch, my associate stepped into the hallway. That wasn’t all he stepped into. It seems that the owners had a cat who apparently couldn’t find the litter box. Being a new agent, I was eager to help my sales manger with this problem. I went on ahead of him into the bathroom, turned on the light and raised the commode lid while he removed the “offense” from his shoe with a tissue. With a flip of his wrist he tossed the tissue toward the commode, but he missed and it hit me in the leg. Yuk! I had to go home and change pants but I smelled that stuff the rest of the day. What if that would have happened to a potential buyer? There was another time when I listed a house where a vicious dachshund stayed inside. He too had a problem knowing where to do his business and as added attraction he would follow potential buyers and bark the entire time we were trying to show the home. It’s a little hard to carry on a conversation over a barking dog while trying to watch your step. I have never thought about how pets could degrade a house’s value. I never knew people would try so hard to get rid of the pets track in the house. 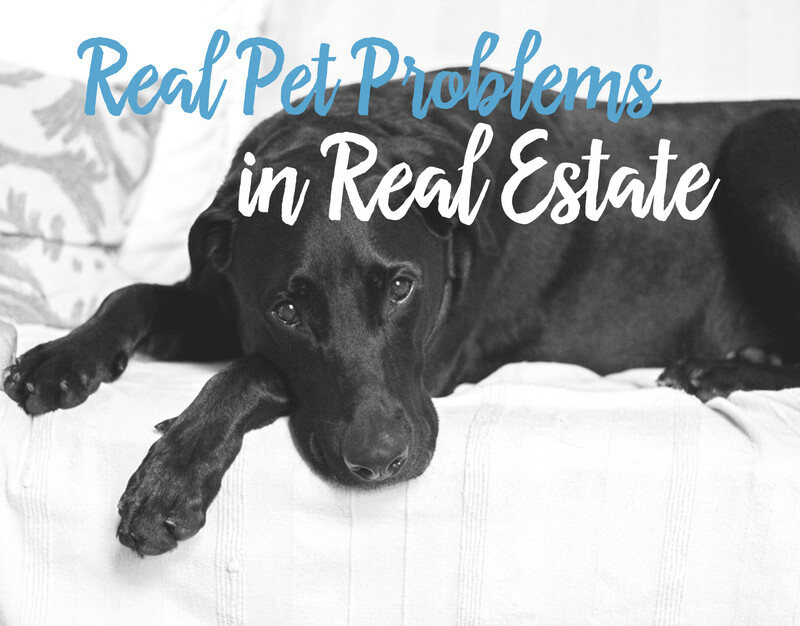 Selling a home that has had a pet in it can be so difficult! If you aren’t thinking about selling from the day you move in with your pet you’re going to end up with some damage, some odor, and maybe some trouble generating interest. If you can keep your pet trained well and the house vented and clean you can combat some of the problems they can cause with selling. My brother is thinking of moving soon, and he has two dogs. I think I’ll suggest he move the dogs out of the house now to try and deal with the odor and make it safe for potential buyers. Do you think taking the furniture out would help to reduce any odors? Thanks for sharing your experience. Now we know what to avoid! Thanks for your comment April! To answer your question, it depends on the furniture – and the pet! If it’s a big hairy shedding dog that always sits in one chair, odds are that it will need to be removed. If it’s a small poodle who occasionally lays on a leather couch, perhaps not. That’s where we come in. We can help you look with fresh eyes, and smell with a fresh nose. We would be happy to help your brother. If he is not in Abilene, we can connect him with one of our Leading Real Estate network affiliates. glad to see this blog.thanks for the review. I did not know that pets and real estate was such a big changer. I would like to know what I need to do to help my home sale. I did not know that it would hurt for me to own a pet. Thanks for your comment. We love our pets, and most people do have them. Pet’s don’t necessarily hurt you in selling your home if the area is clean and they are not a bother to potential buyers. If you are in the Abilene area, we would be happy to come to your house and offer our professional opinion. If you are not in the Abilene area we can refer you to one of our network professionals through Leading Real Estate Companies of the World. I really like your first point on picking the right realtor for you, and not just the best one in the area. Real estate agents specialize in different things, so someone who is good for your friend may not be good for you. Plus, like you said, there’s no one way to find an agent; you just have to find the person who fits you best.